With his top priced purchase, Chris Hewitt, Hewitt Border Leicesters, Warracknabeal, Victoria, and Nathan Kember, Gleneith Border Leicesters, Ganmain and auctioneer, Will Stoddart, Elders, Wagga Wagga. 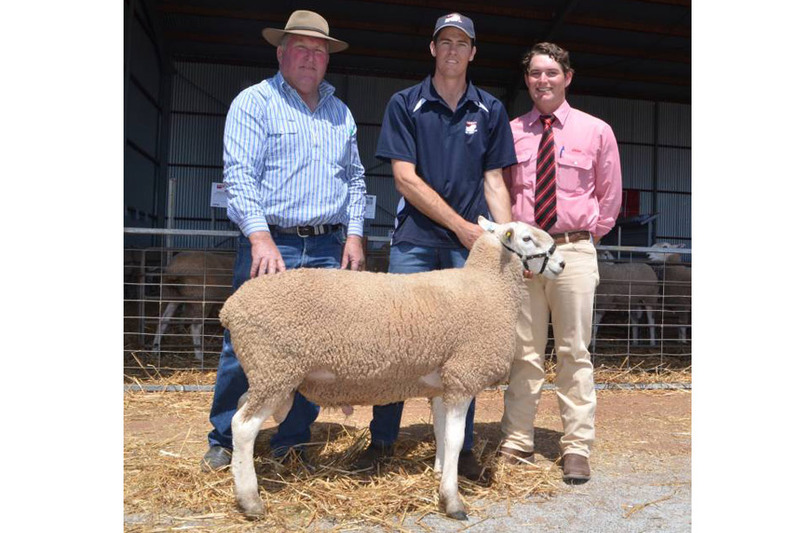 The 13th annual on-property sale on account the Kember family, Gleneith Border Leicester stud, Ganmain, saw a one hundred percent clearance of the 100 rams offered to top price of $3500 and average $1607. A feature of the sale was the strong interest from repeat buyers who purchased larger drafts than normal, according to studmaster Wes Kember. “It was a phenomenal sale, reflecting the strength in the sheep industry,” he said. The top priced ram, a twin son of Gleneith 69-13, was purchased by Chris Hewitt, Hewitt Border Leicesters, Warracknabeal, Victoria. Mr Hewitt said his new purchase has all the credentials of an outstanding sire prospect, with his outlook matching his figures. Among many volume buyers, Ruby Park Pastoral Co, Collingullie, purchased 11 rams to top $1700 and average $1355, while Burgess Hill Pastoral Co, Coolamon, selected a draft of six rams for average price $1600. The sale was conducted by Elders, Narrandera and Wagga Wagga, with Will Stoddart taking the bids. "At Gleneith we believe in breeding Big, Long & Highly Fertile sheep suited to commercial enterprises."